Muffins have to be one of my favourite things to eat for breakfast because you can have sweet muffins or hearty muffins, or both. They are truly one of those baked goods you can never get tired of because they are just so versatile! 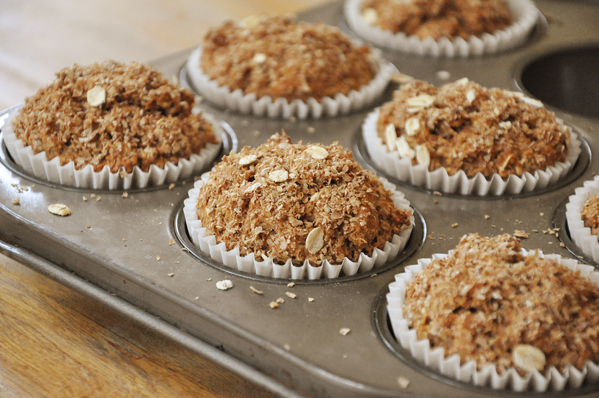 Take my favourite carrot muffins and apple muffins, you’ll never go wrong with muffins, and my new favourites, these Whole Wheat Bran Muffins. You can eat muffins in a multitude of ways, warm from the oven with a dollop of butter and a big glass of milk, or, as you run out the door in a flurry after you spent that extra five minutes in bed or as you sit at your desk working. Anyways, these are the perfect breakfast muffins, especially when eaten warm straight from the oven (that’s when they taste best!) Plus they are pretty good for you, as far as baked goods go, whole wheat bran muffins, with a hint of cinnamon and apple … gimme! Begin by preheating the oven to 375. Line a muffin tin with paper cups or grease with butter. Whisk the flour, oats, 1/3 cup bran, baking powder, baking soda, cinnamon and salt in a bowl. In a separate bowl combine the egg, milk, apple sauce and maple syrup. Pour the wet ingredients over the dry ingredients and stir together until just mixed. Do not over mix, this will lead to a dense muffin! Using an ice cream scoop, scoop batter into muffin tin. Sprinkle the tops with bran and a few oats. These muffins are a little bit dry, so I highly recommend eating these straight out of the oven with a big glass of milk and a little butter! I was wondering, did you use pure maple syrup or did you use the "fake stuff" (as my little sister calls it)? I used pure maple syrup, but you could probably use the "fake stuff" but it wouldn't be as flavorful and slightly sweeter.